Drowned in Sound absolutely adore St Vincent, and having seen a clip of her in soundcheck on said website a few weeks ago I was intrigued to learn that her support slot on the Grizzly Bear tour was solo. 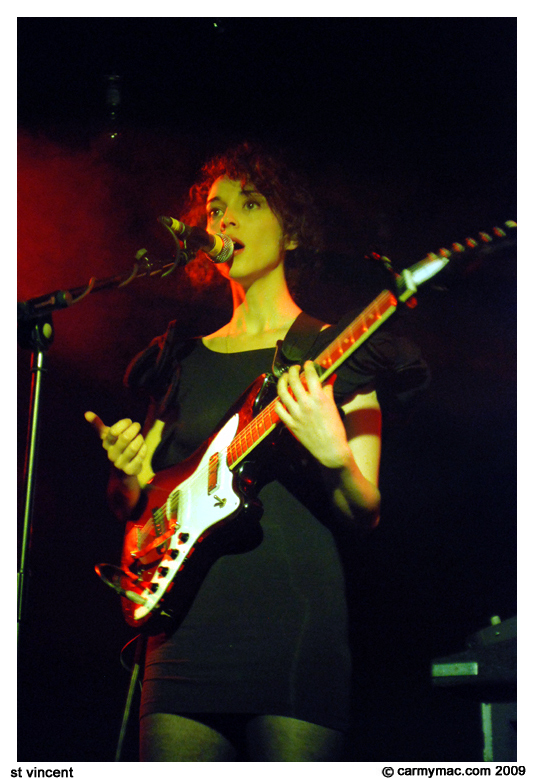 Apart from supplementary guitar on one song by Grizzly Bear’s Daniel Rossen, it was just Annie Clark, a looping pedal, and some sequenced backing. I must say I was surprised by how diverse she could be within those limitations. As Sam commented to me after The Strangers, she somehow managed to go seamlessly from 40s jazz guitar to an onslaught reminiscent of Joe Satriani in just 30 seconds. Songs such as Save Me From What I Want worked really well with her looping backing vocals along with herself, and during the more frenetic passages of Marrow she had the appearance of a manikin suffering a seizure. Her cover of The Beatles’ Dig A Pony was a pleasant surprise too. I was very impressed, and would like to know how these songs come across with a full band. This entry was posted in Eclectic Mainline, Live Music, Reviews and tagged Annie Clark, Choir Of Young Believers, Daniel Johnston, gig review, Grizzly Bear, Laura Marling, live review, Mew, Nina Nastasia, review, St. Vincent, The Beatles, The Wave Pictures on November 9, 2009 by Albert. This entry was posted in Eclectic Mainline, Playlists and tagged albert freeman, Choir Of Young Believers, Daniel Johnston, Grizzly Bear, Laura Marling, Mew, playlist, St. Vincent, The Wave Pictures on November 5, 2009 by Albert.